The perfect, vegan, easy to digest comfort food. 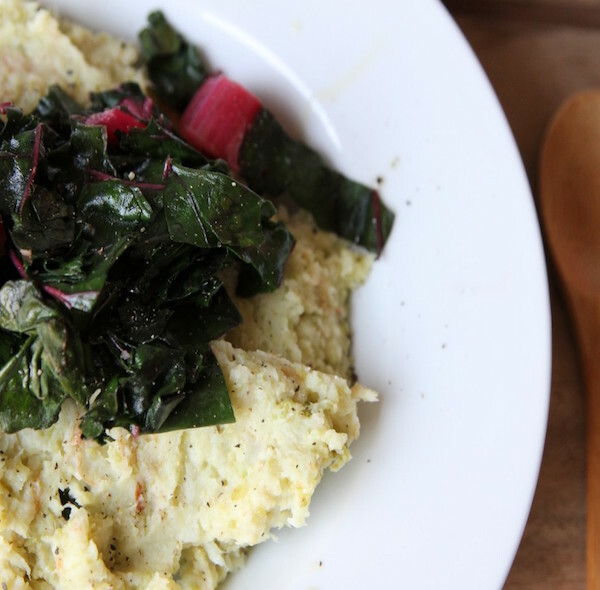 Cauliflower mash with garlicky greens is a great dinner and is also grain free, low carb and totally delicious! Bring a large pan of salted water to a boil. Add cauliflower and cook until very tender (takes around 10 minutes) .Whilst the cauliflower is cooking place the garlic and oil into a non stick frying pan and slowly start to cook. As the garlic softens add the greens and and let them soften over a low heat. Drain the cauliflower and put back into the pan. Add oil and milk and mash till soft – towards the end you can beat it with a wooden spoon to get a soft creamy texture. Season with salt and pepper. Ladle the mash onto a plate and gentle place the greens on top. Pour over any additional garlicky oil and finish with a squeeze of lemon and a sprinkle of pepper.